The digital team are on a mission this year travelling around the country capturing stunning images of our favourite installs to feature in our new 2019 Product Brochure. Our collection of exquisite hi-res images have been carefully selected by our team to help stimulate you to transform your home and garden. By creating this assortment of lifestyle shots we are able to express the aesthetic appeal of our systems and highlight the great benefits at the same time. In July we travelled into the heart of London to visit our clients at their penthouse suite in Battersea, the terrace garden overlooks the London skyline with a fabulous view of the iconic Battersea Power Station, with great perks like this you can understand why the clients have invested heavily in their outdoor living area to make it comfortable and accommodating. 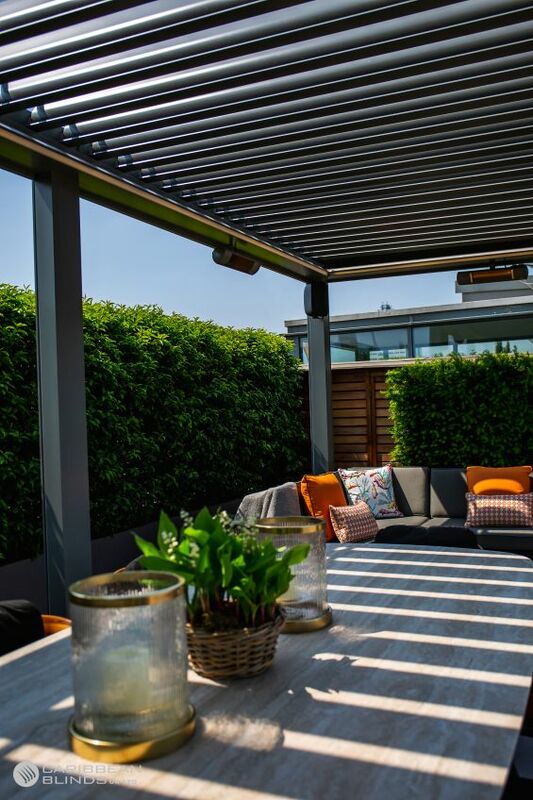 The Deluxe Outdoor Living Pod™ sits to the right side of their city terrace garden, stretching 7m across sheltering a large alfresco dining area at one end and a cosy styled outdoor furniture set on the other. 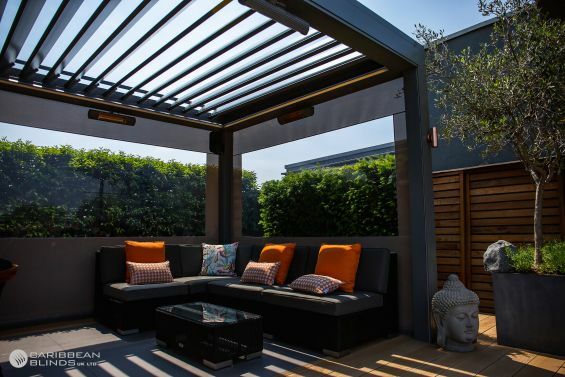 As soon as you enter the roof top garden the louvered pergola grabs your attention with its striking appeal and draws you in to enter into its presence and experience the luxury lifestyle of outdoor living. The combination of the bespoke canopy and the carefully selected outdoor furniture décor and soft furnishings creates a very lavish setting that would make you never want to leave. Our team of designers worked closely with the client to create a unique custom-made Outdoor Living Pod™ to harmonise with the rest of the terrace garden design features. The aluminium louvered structure was powder coated to a Mouse Grey Smooth Matt (RAL 7005) which created a gorgeous effect that contrasted perfectly with the bespoke gold light fixtures which were mounted on the upright posts. To set the scene we integrated ambient internal perimeter lighting and fixed outdoor speakers in two corners of the louvered pergola. 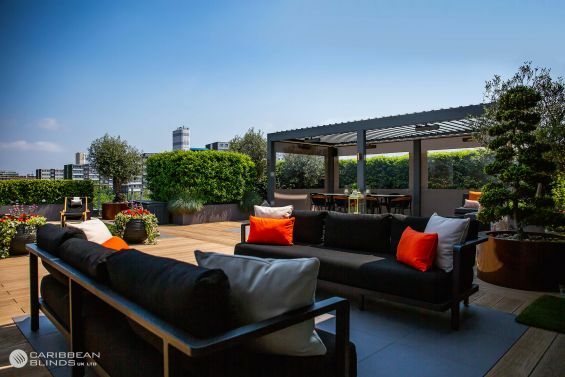 With the penthouse garden being quite high up you can imagine that there is a lot of wind to tackle so we incorporated windproof side screens with clearview windows so it was not to spoil the view on all sides and to help enclose the sheltered space away from the elements. We thought of everything to make sure that this Outdoor Living Pod™ design was fitting with the client’s lifestyle. 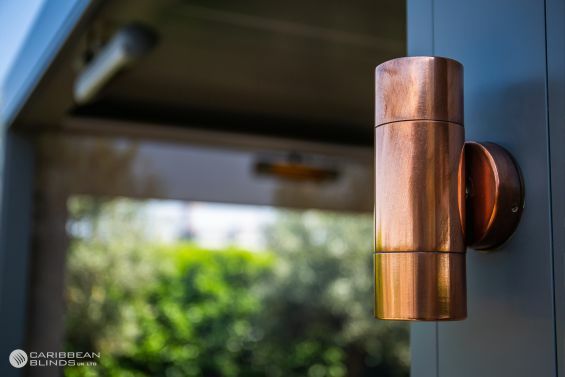 Our team of designers and surveyors are dedicated to creating the ideal outdoor living solution and they will do their best to overcome obstacles to help maintain your original vision. Contact our team today to discuss your options and see how we can transform your external living space – 0344 800 1947 or alternatively fill out our enquiry form and we can send you more information on our innovative shading solutions and award winning outdoor living products.